Kate Burge Sea-to-Summit Fell Race on the Isle of Man. A write up after an amazing time over the weekend at the Isle of Man, with Claire Cobley, Ruth, Stu and Findlay Hutchison, Sean Willis and Suzanne Darke. 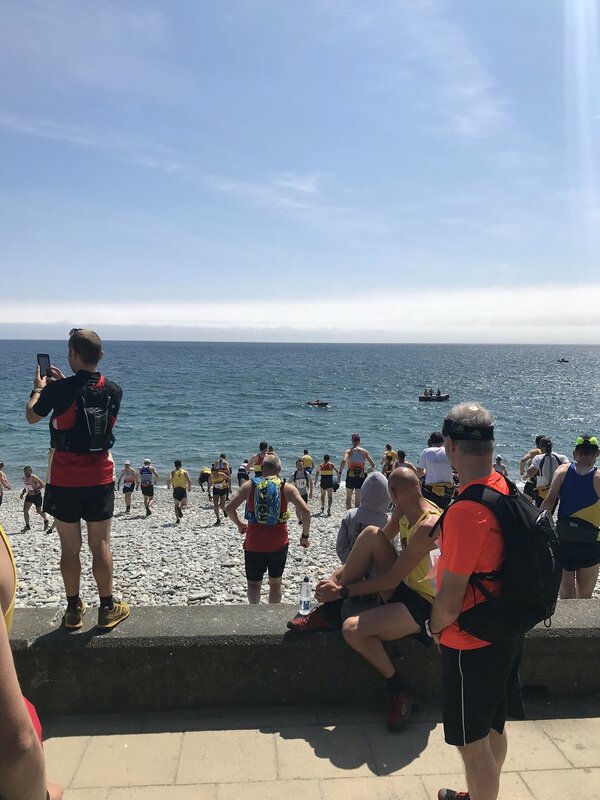 Saturday 14th July saw the Kate Burge fell race in memory of Kate who was sadly killed whilst cycling home from work on the Isle of Man in 2014. It was also an English Championships race in the 2018 fell running calendar. It starts in Laxey on the east cost of the island and climbs to Snaefell, the highest point of the island. 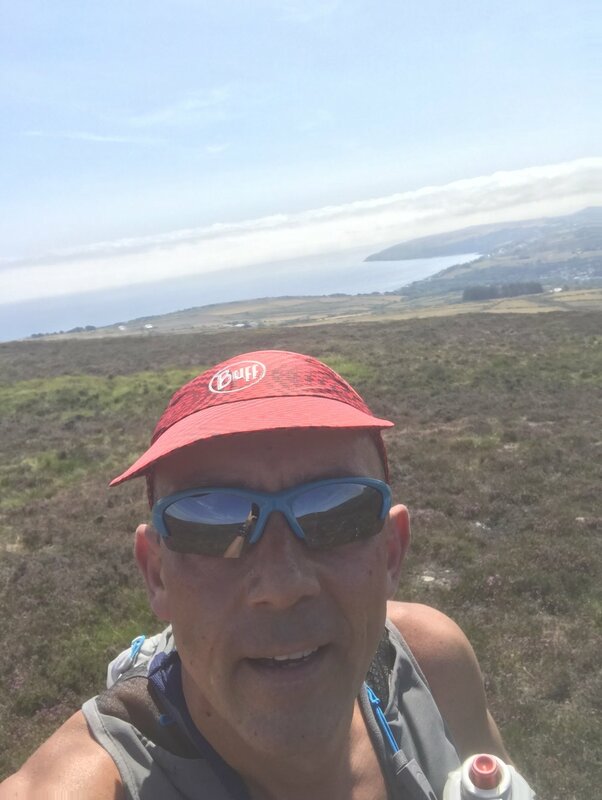 It's a one way route of 8.5 miles and a staggering 3.8k feet of cumulative climb, across this distance and rough moorland terrain on climbing out of Laxey. The first three miles see a solid climb from the promenade to Sileau Roy at 396 metres above sea level, so a solid 1,500 feet climb from sea level right at the start. It's hard, and it's called the Sea to Summit for a reason. Saturday? Solid sunlight, with temperatures around 25 degree C, which made for tricky conditions on the first climb. 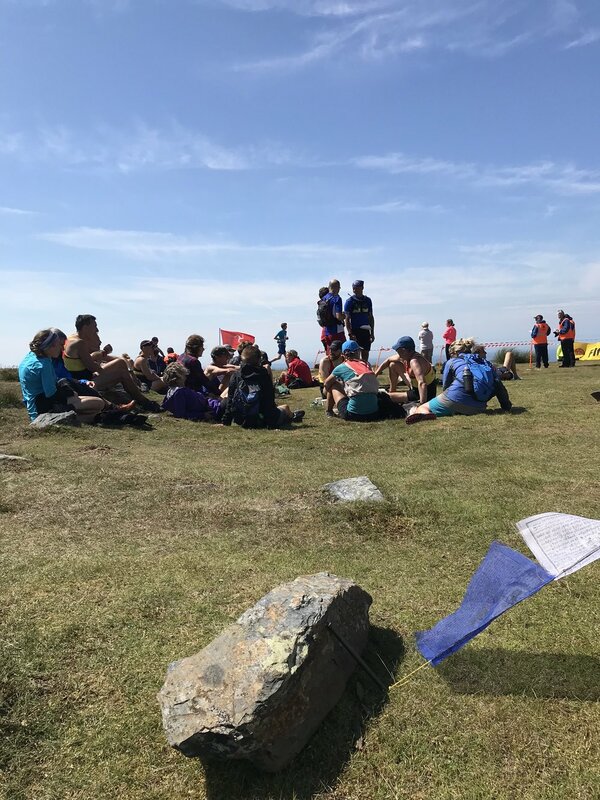 There are three very hard climbs in the race: Clagh Ouyr, Mullagh Ouyr (the hardest due to tired legs and horrific heat), and the last climb to the summit of Snaefell. Saddleworth Runners fielded three ladies: Claire Cobley, Ruth Hutchison, and Suzanne Darke. Three men: Peter Cobley, Chris Davies, and Sean Willis. The rest of the pack? Some of the best fell runners in the UK... gulp. 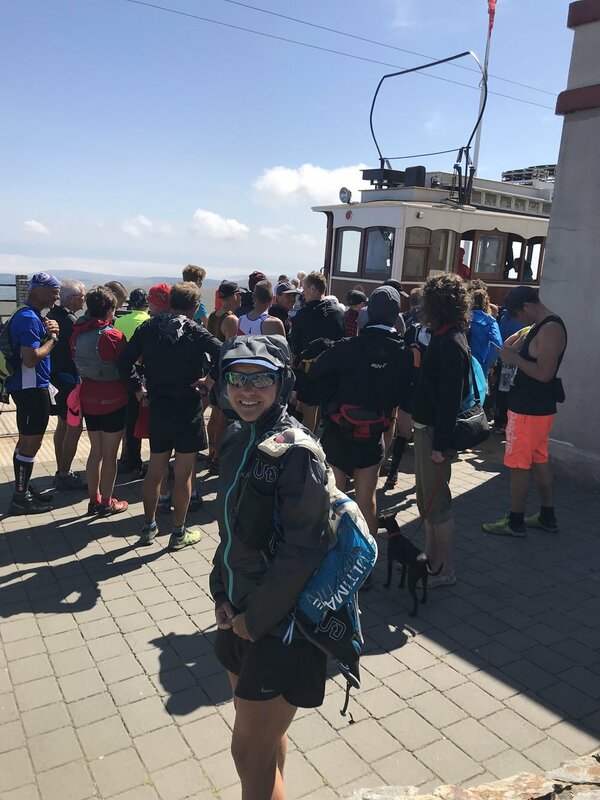 Kate Burge Sea-to-Summit: http://www.katesrace.co.uk/ and Results for 2018. All had a cracking weekend initially arriving late on Friday from the catamaran ferry from Liverpool into Douglas at the B&B outside Peel around 11.15pm. Stu, Ruth, Finlay, and myself in one car, with Suzanne and Sean on foot camping outside Douglas. The B&B is a working farm called Knockaloe Beg Farm, that also has people visiting to see the animals and play; see the footage of me on the self-propelled go karts! It was and is a fantastic place in which to relax with excellent facilities, warmth and comfort, and lovely owners. We could not have asked more from Fiona. 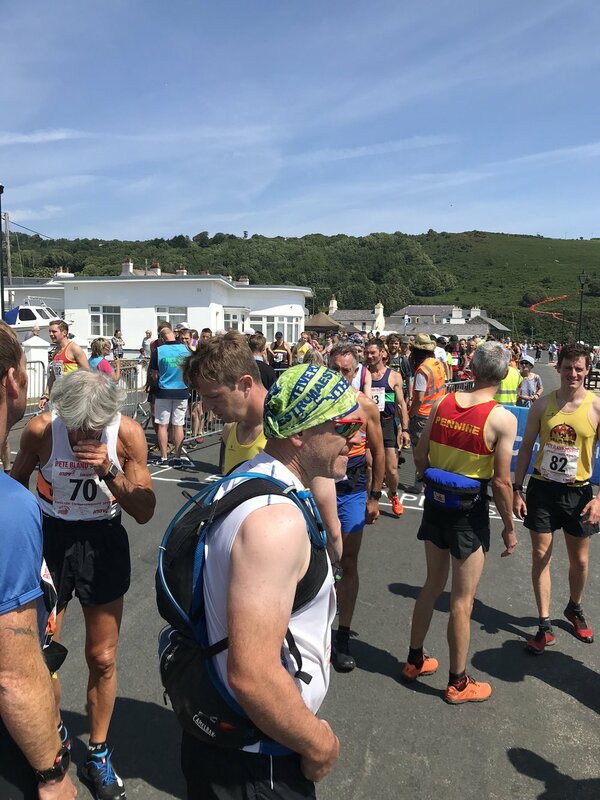 Saturday was taken up with the race and the food and music festival after the race laid on for the runners in Laxey on a blazing summer evening. Finlay Hutchison was the small star of the proceedings and went with the flow of being shuttled about in a mostly graceful manner. We delighted in hearing him say "no" or "more"! It was also nice to unexpectedly bump into Chris Davies and his wife; as ever he was on good form. One highlight was waiting for the tram back from Snaefell with lots of fell runners, bewildered tourists, and then a nice walk back to the promenade in Laxey.